In January 2016 php.net, released new latest version of PHP. This PHP 7 Version comes with new Zend Engine and lots of new features. Here in this articles , I will show you php 7 installation via two method , first one is webtatic yum repository and second method is from source tarball on centos / rhel 7, 6 Version . Now php developer will use in php editor new version of php 7 version and provide good functionality for clients. Here are some features of PHP 7 , which makes php 7 is different from older version . PHP 7 is twice faster than PHP 5.6 Version. Here we are going to configure EPEL and webtactic Repository on CenOS / RHEL 7 and RHEL 6 Version. Run below command according to your Operating System. After installation of these two repositories on your server then we will go throgh on our next steps to install php 7 and its module installation , if needed. PHP 7 available in webtactic package list , you can check through below command . Below is Output of last running command. Configure EPEL Repository as we discussed in method 1 in CentOs 7 server box through below command and install required package for php 7 installation. After extract the php source tarball, go into the directory. Below is the screencast for files are there after extracted . Run the below commands to perform build and compile php 7 source installation. May be you will get error of C compiler package or libxml2 or other library dependency to compile such source software. Here I have install on my fresh centos 7 server, your case can be a different , you need to follow the error and install other dependency according to server configuration. Here I had run below command for my dependency package errors. 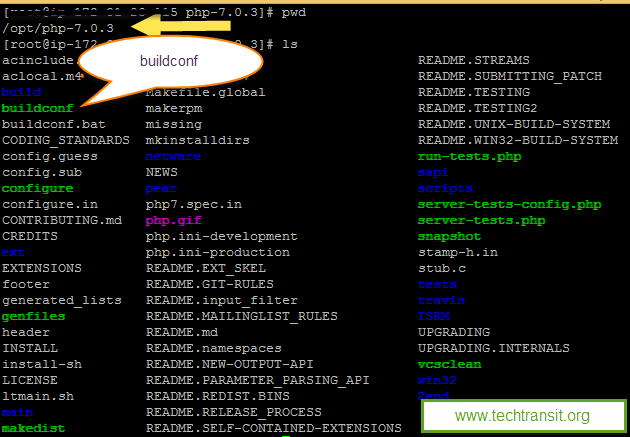 And again run the ./buildconf –force , after completing the build , proceed for next steps through below commands. From below command you will get show compiled in modules .